The Aotearoa/New Zealand section is about the land, people and the country as a filming location. While relevant mainly to overseas filmmakers contemplating shooting in New Zealand, some of it will be useful to locals. Although intended as a factual rather than a promotional piece, it does give an indication of the range of scenery and provides detailed information on New Zealand’s mountains and the most popular locations for foreign produced productions. It also provides a guide to the policies, regulations and institutions that relate to filmmaking in New Zealand but, as each production has its own requirements and circumstances, it is not intended as a complete manual. A New Zealand production manager or location manager should be contacted for detailed information. 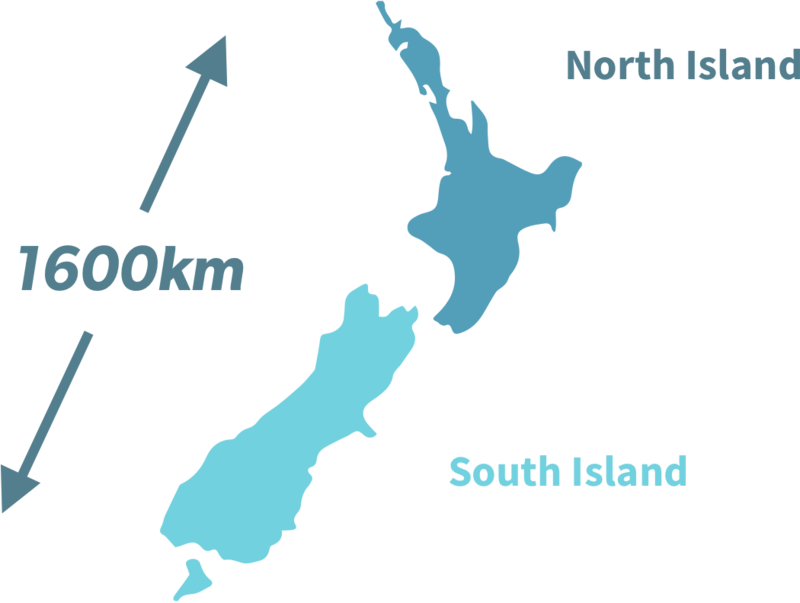 New Zealand is 1600 kilometres (1000 miles) in length and is made up of two major islands: North, 115,000 square kilometres (44,000 square miles); and South, 151,000 square kilometres (58,300 square miles). New Zealand lies 10,400 kilometres (6462 miles) south-west of North America, 1700 kilometres (1056 miles) south of Fiji and 2250 kilometres (1400 miles) east of Australia. New Zealand has a population of over 4,500,000. Over 700,000 are Maori, the indigenous people of New Zealand, who are of Polynesian origin. The majority of New Zealand’s population is of British descent, with xsall but significant immigrant groups from Asia, the Pacific Islands and Europe. Almost 80% of New Zealand’s people live in the country’s urban areas and almost 75% of the population reside in the North Island. New Zealand’s climate is generally oceanic and temperate, apart from a subtropical area in the north of the North Island. Summers are warm throughout the whole country. In winter the North Island experiences snow only on mountain peaks. There is more extensive snowfall in the larger mountain regions of the South Island. There is moderate rainfall in most areas all year round. The seasons are the reverse of the Northern Hemisphere – warmer from November to March and cooler from June to August. 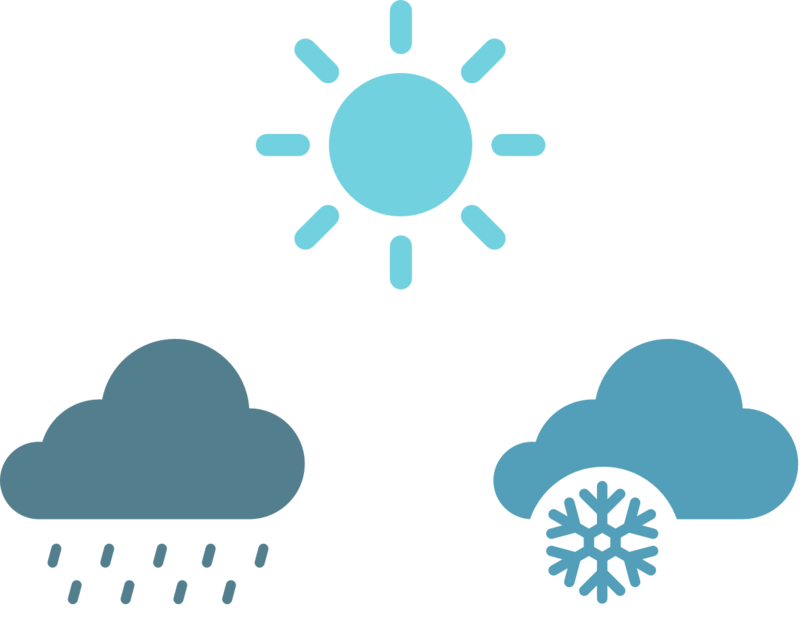 The Meteorological Service website – www.metservice.com/ – provides weather forecast information. New Zealand has three official languages, English, Te Reo Maori and New Zealand Sign Language (NZSL). English is spoken by all native New Zealanders. New Zealand offices and businesses generally operate from 9am to 5pm Monday to Friday. Most shops open 9am to 5pm or 5.30pm in the main cities, with longer hours – until 9pm – on Thursdays or Fridays. Shopping malls are open all weekend. Nationwide there are several supermarkets open 24 hours. Countdown has also launched a free shopping app for iPhones. There are 3 ½ days when almost all shops are required to be closed under the Shop Trading Hours Repeal Act 1990. Banks are open between 9am and 4.30pm Monday to Friday. Some branches are open on Saturdays. Automated Teller Machines (ATMs) are available throughout the country and operate 24 hours a day. All major international credit cards can be used in New Zealand. Internet, telephone and text banking is offered by all New Zealand banks. Regional/Provincial anniversary days are generally observed on the Monday or Friday nearest the actual date. New Zealand is 12 hours ahead of Greenwich Mean Time (GMT). Clocks are put forward one hour during Daylight Saving, which begins on the last Sunday in September and extends through to the first Sunday in April. and serviced motel units with kitchens. New Zealand operates a Multiple Earthed Neutral (MEN) system. The voltage is 400 volts 3 phase, or 230/240 volts single phase at 50 hertz. The standard domestic connectors and sockets are NZ Standard type 198, 10 amp, flat 3 pin, common only to New Zealand and Australia. For higher amps the New Zealand film industry has standardised to British Standards 4343 or the equivalent European Standard CEE17. Temporary connections to permanent mains supplies must be carried out by a New Zealand registered electrician. New Zealand has a public health system. Hospital treatment is subsidised and in most instances is free to residents (proof of permanent residency is needed prior to treatment). Medical services are not free for visitors, who are advised to take out medical insurance. Registered medical practitioners, medical centres, hospitals and urgent pharmacies are listed in the ‘Medical’ section at the front of telephone directories. Chemists are open only during normal shopping hours, but may display addresses of urgent (late night) pharmacies. Hours of operation of these pharmacies are also listed under ‘Urgent pharmacies’ in the ‘Hospitals’ section in the front of each region’s phone books. Emergency Services are also listed in the front of each region’s phone books. In case of emergency, 111 is the number for ambulance services in main centres (as well as for the police and fire service). To protect people from the health effects of second-hand smoke, smoking in all hospitality venues including bars, restaurants, cafes and casinos is prohibited in New Zealand. Smoking is also banned in all offices, shops, shopping centres, aeroplanes, public transport and taxis. New Zealand has a wide variety of terrain within a relatively small area – mountains, lakes, rivers, fiords, gorges, glaciers, volcanoes. Its coastline is long with many types of beaches. A large part of the country has golden sands. In the sub-tropical north of the North Island (eg Bay of Islands) there are white sands and clear water. In the South Island there are rugged coastlines (eg Kaikoura) and special features such as the blowholes at Punakaiki on the West Coast of that island. The west coasts of both islands have black iron sand beaches, while the Marlborough Sounds and Fiordland coasts are fiords with narrow beachlines and deep bays. The major mountain region in the South Island is the Southern Alps. New Zealand’s highest mountain is Aoraki / Mount Cook, which is 3754 metres (12,316ft) high. In the South Island lakes district are the Fox and Franz Josef glaciers which flow close to the sea. The central North Island has three main volcanoes – Ruapehu (2796m, 9175ft), Ngauruhoe (2290m, 7515ft) and Tongariro (1968m, 6517ft). To the west of them is Taranaki (Mount Egmont) (2518m, 8260ft). There are eight major lakes in the South Island. The largest is Te Anau (344 square kilometres, 133 square miles), followed by Wakatipu (at Queenstown) and Wanaka. New Zealand’s largest lake is Taupo in the North Island, which extends over 606 square kilometres (232 square miles). It is the crater of an extinct volcano. The central North Island is a volcanic plateau with areas of thermal activity, hot springs, mud pools and geysers, particularly around Rotorua. Limestone caves at Waitomo on the west coast of the North Island are another special feature. New Zealand also has a variety of rivers, from the wide braided ones flowing through the flat land of the Canterbury Plains (Rakaia, Waimakariri), to the swift flowing waterways in deep gorges such as the Shotover and the Clyde in Central Otago, to the Waikato, a wide river with gentle bends flowing through rich pasture land, and the Whanganui, which has thick native bush down to its banks. There are areas of native forest in the West Coast of the South Island, the Nelson area, the eastern North Island and kauri forests in the north of the North Island. Large exotic forests, mainly pine, can be found in the centre of the North Island, near Taupo and Rotorua. The diversity of landscape and vegetation means that in a short journey it is possible to pass through all of the following: dune sands and dune vegetation, coastal forest and sub-tropical rainforest, high-rainfall beech forests, lowland swamp forest and open lowland swamps and bog, sub-alpine grasslands and scrub lands, alpine herbfields and moorlands, alpine barrens of rock, snow and ice, dry beech forest and scrub lands, and semi-arid grasslands. Five of the most popular locations in the mountain regions are Mount Ruapehu (North Island); Coronet Peak/The Remarkables, Cardrona/Treble Cone, Aoraki/Mount Cook (all South Island) and Mount Taranaki (Egmont). Mount Ruapehu is in Tongariro National Park, a volcanic plateau in the central North Island. The three main mountains in the park, Ruapehu, Tongariro and Ngauruhoe are all volcanoes, Ruapehu having been active in the winters of 1995 and 1996 and in 2007. Two popular locations in the area are the Desert Road and the Tongariro River. The National Park is approximately 300 kilometres from Auckland and Wellington. Mount Ruapehu has two skifields, Whakapapa and Turoa. Aoraki/Mount Cook, New Zealand’s highest mountain (3754m), is in the Southern Alps in the west of the South Island. More than a third of Aoraki/Mount Cook National Park is permanently under snow and ice. The park contains several glaciers; the best known is the Tasman Glacier. Coronet Peak and The Remarkables are popular ski fields in the south of the South Island, at Queenstown. The area around Queenstown has a varied landscape of mountains, lakes, tussock plains and native bush. Snowfall usually begins in June, with best cover from mid-July to mid-September. Cardrona and Treble Cone ski fields are both 29 kilometres from Wanaka, in the south of the South Island. The region features snow-capped mountains, Lake Wanaka, tussock country and the Pisa Range. Near Wanaka is Mt Aspiring National Park. The usual snow season is from late June to the end of October. Mount Taranaki (Egmont) is the central focus of Taranaki region. It is 2518m/ 8260 ft high and is one of the most symmetrical volcanic cones in the world. Due to its resemblance of Mount Fuji, Mount Taranaki featured in the 2003 film The Last Samurai featuring Tom Cruise. Mount Taranaki is one of the most accessible mountains in the country and the National Park features over 200km of picturesque walking tracks including the eerie ‘Goblin Forest’ that is filled with thousands of moss-covered trees. Mount Taranaki is snow-capped in winter but snow is only found at the summit in summer. There are more than 200 international flight arrivals and departures to New Zealand each week. There are over 20 key carriers operating aircraft to New Zealand and a similar number operating on a code-share only basis. For information on flights operating to and from New Zealand, contact the relevant airline or the websites of the seven international airports (see the International Airports section). Air New Zealand flies to these destinations: Auckland, Blenheim / Marlborough, Christchurch, Dunedin, Gisborne, Hamilton, Hokitika, Invercargill, Kapiti Coast, Kerikeri /Bay of Islands, Napier / Hastings / Hawke’s Bay, Nelson, New Plymouth, Palmerston North, Queenstown, Rotorua, Taupo, Tauranga, Timaru, Wellington, Whanganui, Whangarei – in New Zealand. Four levels of fare are available with different pricing structures and degrees of flexibility. Domestic terminals in Auckland, Wellington and Christchurch are self service in style, with easy to use check-in kiosks, a bag drop area and scanners for self-boarding at the gate. Jetstar operates between Auckland, Christchurch, Dunedin, Napier, Nelson, New Plymouth, Palmerston North, Queenstown and Wellington. Different fare levels are available. Freephone: 0800-800 995 (within NZ). For flight information please contact the airline concerned. The Interislander operates a regular passenger and vehicle drive-on ferry service that links the North and South islands between Wellington and Picton. Crossing Cook Strait takes approximately three hours on the Interislander. Bluebridge Cook Strait Ferry provides freight services between the North and South Islands, across Cook Strait and between the ports of Marlborough and Wellington. Strait Shipping is the parent company of the Bluebridge Cook Strait ferry, which sails daily between Wellington and Picton. Rail freight services in New Zealand are provided by KiwiRail. Driving is on the left-hand side of the road in New Zealand. There are three toll roads in the North Island. See www.nzta.govt.nz for payment options. Drivers and passengers must wear seat belts at all times in both front and rear seats. Any visitor to New Zealand may drive for up to 12 months if they have either a current driver’s licence from their home country or an International Driving Permit. All drivers must carry their licence or permit at all times when driving. The minimum age for sitting a learner driver’s licence is 16 years. Rental vehicles are readily available from a range of companies including Hertz, Budget, Avis, Thrifty. There are age restrictions for driving rental vehicles. Land Transport New Zealand’s website www.ltsa.govt.nz has details on the New Zealand Road Code (including the new give way to the right road rules) and other motoring information. The Road Code is also available from rental car companies and most bookshops. New Zealand has a reliable postal network. Details of postal rates and services can be obtained from any NZ Post office. Courier and freight delivery companies are listed in the Yellow Pages telephone directories. The international access code for New Zealand is 64. There are several providers of cellular services in New Zealand. These networks also offer data. Visitors will need global roaming to use their own phones in New Zealand. Dialling information, tables of local and international toll charges, STD & ISD codes and emergency numbers are listed near the front of phone directories. Doctors and hospitals are also listed in the front of the directories or google ‘emergency doctors’ or ‘public hospitals New Zealand’. Information on what to do in an emergency is given on the inside of the front cover. – see www.broadbandmap.govt.nz/suppliers-details/ for more information. Australian citizens are able to enter New Zealand and work for an indefinite period without needing to apply for a work visa. This also includes any person who has permanent residency in Australia, and holds a current resident return visa issued by the Government of Australia. Citizens of all other countries who wish to work in New Zealand must apply in advance to their nearest High Commission or the nearest regional New Zealand Immigration Office. Work visas may be issued (for the period requested) to entertainers, performing artists and associated support personnel who intend to engage in any form of private or public performance in New Zealand for remuneration. there is adequate evidence that appropriate consideration has been given to the employment of available New Zealand entertainers or professionals. As well as the above, the applicant’s full name, nationality, and date and place of birth must be supplied before an application for a work visa can be processed, and there must be a guarantee of accommodation and repatriation. Cast or crew applying for work visas should apply to the New Zealand Immigration Service (NZIS) at least 10 days before the event and as far in advance as possible. They must also supply the above information to the relevant New Zealand union or professional association if they intend to be in New Zealand for more 14 days and obtain their agreement. This can be obtained by either sending a copy of the employer supplementary form to the relevant guild or union and providing evidence of this with any work visa application or by obtaining a letter of non-objection from the relevant organization. If the union or professional association has any objection, NZIS will consult with the parties to resolve the disagreement. If the parties cannot reach agreement, the application will be referred to the Minister of Immigration. The NZ Immigration Service’s policy on overseas artists is reviewed from time to time. Contact your local Immigration NZ representative for the most up-to-date information. Health and Safety in New Zealand workplaces is regulated by the Health & Safety at Work Act 2015. The act promotes health and safety management in the workplace and focuses on the prevention of harm to employees at work. It defines three positions of responsibility – PCBU, Officer and Worker. Your obligations will depend on your role within the production process, including the amount of control and influence you have over any particular aspect of the project – the more senior your role, the more responsibility you will have for ensuring the safety of yourself and others. Employers, employees and self-employed workers are expected to ensure that their actions at work do not result in harm. The Screen Industry has developed its own Code of Practice based on the 2015 Act and this is available at http://www.ScreenSafe.co.nz. Instigated by the Techos’ Guild, ScreenSafe Limited is a Techos’ Guild project to provide information and education and is a collaboration of all sectors on Health and Safety in the Screen Industry. This replaces the Safety Code of Practice for the NZ Film & Video Production Industry 1995. WorkSafe New Zealand is the Regulatory Authority for Health and Safety in New Zealand. The purpose of this act is to promote the sustainable management of natural and physical resources. The environmental impacts of activities – such as filming – are primarily controlled by the RMA through the requirement to apply for resource consents as well as through any conditions for permitted activities included in the relevant regional or district plan. The Ministry for the Environment is responsible for administering the RMA and ensuring that it is being implemented effectively. The Accident Compensation Corporation (ACC) is a Crown entity which administers New Zealand’s accident compensation scheme, which provides accident insurance for all New Zealand citizens, residents and temporary visitors to New Zealand. In return people do not have the right to sue for personal injury, other than for exemplary damages and exceptions as per the 1992 Amendments to the Accident Compensation Act. These exceptions can be covered under Employer’s Liability insurance. Employer Liability insurance is not to be confused with Employment Disputes insurance nor with Worker’s Compensation, which is sometimes called Employer’s Liability in other countries. This summary gives the types of insurance generally required by production companies working in New Zealand. It is important to remember that in many instances people working on a production are not “employees” and these people should carry their own insurances as they cannot rely on a Production Company’s Public Liability, Employer’s Liability or Statutory Liabilities policies as they cover the named production entity/s and employees. The NZ Film and Video Technicians Guild has such a scheme for independent contractors. Indemnifies the company for claims arising from libel, slander, plagiarism, infringement of copyright, invasion of privacy, incorrect use of formats, ideas and titles. The policy should take effect from the beginning of shooting, or before, and should usually continue for a period of three years. It may be renewed if required. This cover is usually a requirement of the Distribution Company. Indemnifies the production in case of damage to important props, sets or wardrobe and miscellaneous equipment that would cause delays and increase the budgeted production costs. Provides cover for the company in case of fraud or embezzlement. In some cases the investor(s) may insist on this insurance. Foreign Co-Productions insurance requires another approach as many of the above covers can only be accessed through the studio and the large USA-based specialist film insurers with local advice to complement those covers and also to liaise with the studio and/or their broker on these local covers that are often particular to New Zealand. This service has become a specialisation within the specialist area of film and television production insurance. All risks coverage for camera, sound, electrical and other equipment owned, hired or on loan to the production and for which the production company is contractually responsible for insuring. Breakdown cover is an optional extension that film guarantors may insist on. Provides cover for monies handled by the company, at business premises, in transit and, if necessary, at employees’ homes. The company should insure all vehicles it owns, but it must give insurers specific details on any “action” vehicles for which cover will be restricted. For hired vehicles, although cover is available from the rental company, it is usually not competitive. Separate motor insurance for all hire vehicles and those for which the production company is contractually responsible, eg, equipment trucks will generally save premium. Cover arranged with New Zealand insurers is only for the current market value at the time of the loss. The policy does not include cover for the contents/equipment in the vehicles, transformers attached to the back of vehicles, or personal effects. Equipment/transformers are insured under the Film Package “Miscellaneous Equipment” section and personal effects are not insured but remain the responsibility of the owner. Motor Insurance on rental vehicles, when arranged independently of the rental company, is subject to various legal precedents which, if applicable to the circumstances of the loss, costs may still be the responsibility of the rental company, despite the fact that the production company has arranged its own insurance. This is well known to both insurers and rental companies and is dealt with between the hirer’s insurer and the rental company when a claim is reported. Indemnifies the company against extra costs incurred as a result of loss of, or damage to, raw stock, exposed film, sound stock and recordings. It should also cover the cost of reshooting scenes lost as a result of faults in stock, camera, processing or editing. This risk has changed in recent times as far as insurers are concerned due to the significant increase in the use of CGI footage in a production and further technology changes such as the use of the Panavision Genesis camera system, or Stargate Virtual Backlot, can reduce risk under this section of cover. The risk of loss of image and cost of reshoot has not disappeared with the change to these new formats. Indemnifies the company against costs or loss in case of accident, illness or death of the specified key members of the cast and crew during filming and, in some cases, before filming. Such cover requires a medical by the named cast and/or crew before full cover is confirmed by the insurer. “Essential Element” is a wider form of cast cover whereby the decision to abandon a production following incapacity or death of an insured person is made by the insured and not jointly with the insurer. This cover is usually instigated at the request of the financiers/distributors where a cast member is deemed to be an essential element, in that without him or her there is no production!. All risks cover for props, sets and wardrobe owned, hired or on loan to the production. Indemnifies the production company against claims for negligent acts made by a third party for damage to property and for which the production company may be found liable. “Punitive and Exemplary Damages” cover is an extension which is usually included. An individual may sue the production for punitive damages, but not for the injury itself. Liability arising from the use of aircraft and marine craft is excluded (see “Other Insurances”). Liability from the use of motor vehicles is also excluded, however Third Party Liability cover is provided under the Motor policy. Use of helicopters and aircraft is increasingly common and the correct Charter Agreements and the obtaining of Certificate of Currency from the aircraft owner’s insurer, naming of the production company as an insured, is critical. It is illegal to insure for fines and penalties following prosecution under this Act. However most insurer’s policies will still provide cover for legal costs in defending any prosecutions under the Act and also cover reparation orders as distinct from fines and penalties. Covers loss or damage to, or destruction of property or facilities of others, including loss of use while in its custody, care or control. This policy should work alongside but not duplicate the terms of Public Liability. A New Zealand film insurance broker. GST is a tax on the final consumer at a rate of 15 percent (as of 1 October 2010) for all goods and services, except those with specific exemption. All businesses operating in New Zealand turning over more than $60,000 a year are required to collect GST by registering with the Inland Revenue Department, issuing appropriate invoices and forwarding the tax collected to the department on a regular basis. Contact a local production accountant or the GST section of the Inland Revenue Department. New Zealand film and video personnel are liable for taxation under various systems, depending on the nature of their work and their relationship with the company. www.spada.co.nz or a local production accountant. Maori regard the land as their homeland with every area of New Zealand under tribal guardianship. It is therefore courteous for filmmakers to seek the blessing of the local tribe for major projects, whether they directly involve Maori or not. For films with Maori content or those that require significant participation of the Maori community, it is important to present the project to the tribe on the marae. A local Maori elder can arrange for the filmmakers to visit the marae, or the New Zealand Film Commission can refer filmmakers to a Maori liaison person who will advise visitors on marae procedures and local customs. It is recommended that the delegation is led by high-ranking people on the production and that up to two days is allowed for the visit. Filmmakers wanting to access certain key locations in and around Auckland now have a comprehensive set of guidelines for gaining permission and working on those sites, thanks to discussions between Screen Auckland and Ngati Whatua o Orakei after the latter raised concerns about the increasing demand for filming within its tribal area. For more information see the Approval Requirements under the Locations section of the Screen Auckland website (www.aucklandnz.com/screen). Click here for a map of New Zealand outlining traditional Maori tribal regions. Boundaries are deliberately ill-defined, as an accurate map has never been made. The lines generally conform to major geographical features, eg Whanganui River Valley, etc. New Zealand’s national parks and many areas of protected land cover one third of the country. A concession from the Department of Conservation (DOC) is required for all film crews and commercial photographers involved in filming/commercial photography on public conservation land managed by the Department of Conservation. It is good practice to have as much pre-application discussion with the local DOC office as possible. As far as possible, film applicants should undertake direct consultation with stakeholders and iwi prior to lodging an application. This will reduce the time and cost required for the Department to consult in many cases. Filming applications will generally be classified into one of three categories. Low impact, non-notified applications are those that have little or no discernible effect including any long-term effect when the activity has ceased and those that do not require notification due to either the term applied for or type of interest in the land. High impact, notified applications are those that may have significant effects over the duration of the activity and possibly longer. They will also include those applications that require notification due to either the term applied for or type of interest in the land. There are three main areas of costs that will apply to film crews operating on public conservation land: Application Processing Costs, Location Fees, and Monitoring Costs and Bonds. The costs of processing the application will be recovered from the applicant. Helicopters require a separate landing permit, there are new fees associated with the landing fees. Monitoring of the activities of the film crew is often a condition of the concession. Any costs incurred by the Department will be recovered from the film crew. For larger crews, a condition of the concession may require the crew to directly engage and fund an independent contractor to monitor the filming activities and the effect of the locations. Monitoring fees will have 2 components - an hourly rate for staff time and vehicle costs (per km travelled). Bonds may be required by DOC where there is potential for damage to the environment. The bond should be enough to cover the costs of restoring the locations to their previous condition, including monitoring of the restoration. These figures are correct as of 11th May 2015, but of course may change over time, so it’s worth applicants checking the DOC website or with the local DOC office to make sure they get up to date pricing. All figures are exclusive of 15% GST and do not include application and processing fees and costs, or monitoring fees and costs. Total daily location fee is calculated by multiplying the per person charge by the number of persons in the film crew (including actors and talent), and then adding the standard daily rental. Film crews often shoot only in the evenings and mornings. To take account of this, the total daily charge can be halved for film crews who spend less than five hours filming on any one day. Preparation and Clean-Up days to be charged at 20% of full day rate (ie the total daily fee for the crew involved). Members of the Screen Production and Development Association of New Zealand (SPADA) will qualify, on proof of membership, for a discount of 10% of the total location rentals. This discount does not apply to recovery of department staff time and costs.